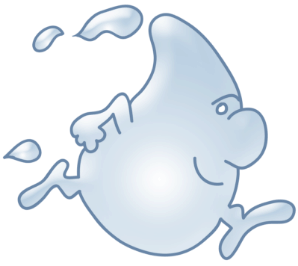 At Water Filters Fast, we understand the importance of having clean, fresh, great-tasting water at your disposal. Equally important is the ability to readily access replacement filters that are easy to install, cost-effective, and available with fast delivery. 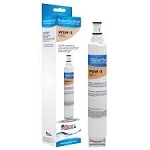 If you are looking to replace the water filter in your KitchenAid refrigerator, you have come to the right place. 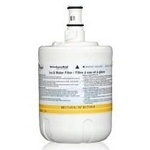 Water Filters Fast supplies a range of water filters and can provide you with the correct fit for your KitchenAid refrigerator at a reasonable price. The use of refrigerator water filters is much more economically and environmentally friendly choice than buying bottled water. Not only will you be reducing your household’s plastic waste levels, but, by switching to water filters, you will also be saving yourself money. KitchenAid is a U.S.-based manufacturer owned by the Whirlpool Corporation, and it has all your kitchenware needs covered. Most KitchenAid refrigerators use Whirlpool Water’s EveryDrop water filters, which combine microfiltration, particle filtration, and absorption filtration in their fantastic Triple Filtration Technology. This technique guarantees the cleanest, freshest water devoid of the most contaminants. 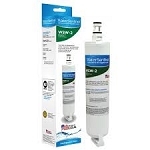 This KitchenAid water filtration system is certified by the National Science Foundation (NSF) and removes the taste and odor of chlorine while retaining beneficial fluoride. Sediment, benzene, solvents, radon, nitrates, pesticides, and herbicides are also among the chemicals and minerals filtered out of your drinking water. You are advised to replace the water filter in your KitchenAid refrigerator every six months, but you can base it on your own refrigerator’s performance. The filter does need to be replaced when you see the indicator light. The water filters fit based on the style of your refrigerator, rather than the size, so you only need to know whether your refrigerator is a French door or top freezer, for example. They are easily removed with a simple twist action. They are also compatible with Whirlpool refrigerators and can even work with some Kenmore, Jenn-Air, Maytag, and Amana refrigerator models.